Producer and director Michael Coleman and team roll with their equipment from San Francisco to LA with the Pro Roller Lite AW. See how they get from airport to studio without any hassles and with lots of ease. 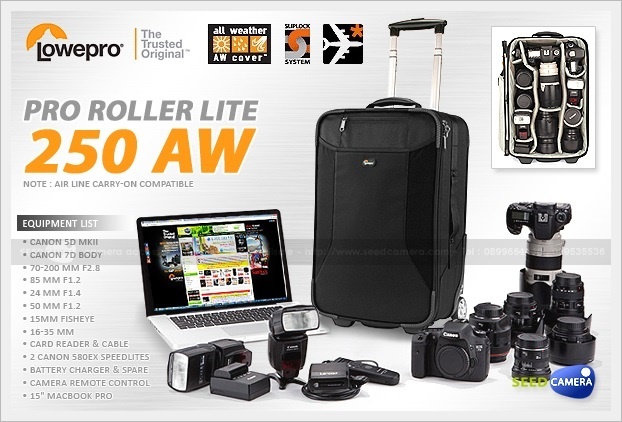 The black Pro Roller Lite 250AW from Lowepro is a travelers bag and slightly larger than the Pro Roller Elite 150 AW version. Made for the inveterate, constantly on-the-go, mover and shooter, this case is made with durability and functionality in mind. It's a lean and mean case that holds a world of gear such as 2 pro DSLRs, one with attached lens such as a 14-24mm, 24-70, f/2.8 or 70-200 f/2.8; 4-5 extra lenses; 2 flashes; spare batteries and memory cards and up to a 15" laptop or tablet plus extra accessories or personal items.